Do you struggle with how to have a quiet line? Is it hard to get your students to clean up quickly and get in line quietly? Then when you try to walk somewhere, they’re super chatty or have trouble walking straight. 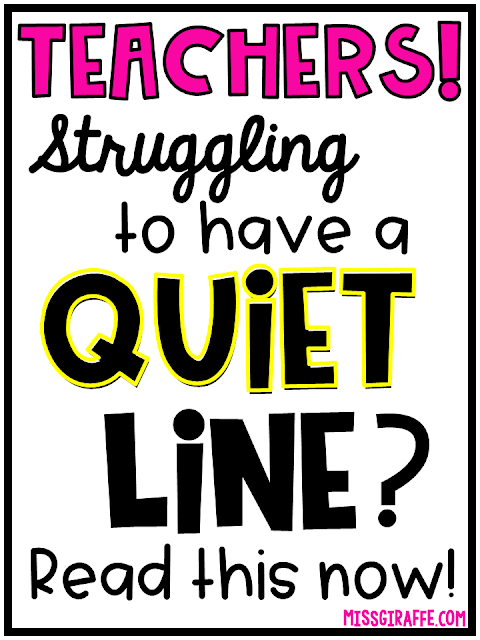 If so, no worries, I have A TON of ideas and activities I’m about to share with you to help you have the nicest looking, silent line in school! After my 25 Chatty Class Classroom Management Strategies for Overly Talkative Students post went viral back in 2016 (and it still gets so many views every day! ), I realized that I’m not the only one who wants classroom management tips for the chatty ones! I have received so many wonderful messages about how Blurt Beans or Blurt Cubes or the other strategies I talked about in that post have transformed their classroom and it makes me so happy. Thank you to all of you who have reached out and shared your stories! I love, love, love hearing them! One question I constantly get, though, is What about when they’re in line? How do I keep them quiet? So I have a lot of tips to share with you to expand on that post – What do you do when they’re OUTSIDE the classroom… walking in line… for the whole school to see? First, Ditch the Line Order! 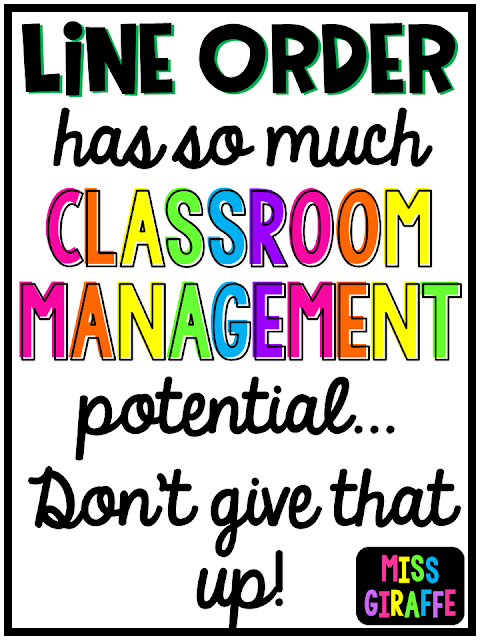 If you’re using a line order where students always line up in the same order every time, stop that right away! I have NO idea why people do this. They’re always next to the same people and there is SO. MUCH. POWER. in the actual act of lining up! Line order ruins that by having a predetermined place. Think about it – when going somewhere, kids LOVE to be first. They also love getting to be by their friends. If they already know their place in line is predetermined, why would they do anything for you to get in line? Why would they behave in line once they get there? There is no incentive. They’re going to take their time during clean up, not clean up as well as they could, talk to their friends, tap their friends, etc. If they know their behavior makes all the difference as to their spot in line, they will work for those coveted first spots. They want to be the first in line to go to lunch, first to recess, etc. so it is always something earned and has so much power. Kids will clean up so much faster in transitions if you tell them you’re looking for the best and quietest cleaners to line up first. It’s gold. Not only will lining up be so much less stressful but your classroom will look so much nicer and transitions will be so much faster! No one lines up until their table is clean and super organized… the quietest cleaners with the tidiest table line up first. Line order has so much classroom management potential. Don’t give that up! As they’re all cleaning, you can say, “Wow, red table is looking really nice! They’re so quiet!” “I love how green table is making sure there’s nothing under their table. They’re almost ready to line up!” “Wow, yellow table is almost done! All the supplies in their caddy are in the right compartments and look so organized.” to basically tell them exactly what you want without sounding bossy. Their directions are to completely clean their table and its area, then sit in their seats quietly with their hands folded to show they are ready to line up. Then, once you actually pick the first table to push in their chairs and line up, the other tables will really scramble! Let the other tables keep cleaning while that table lines up. You’ll only call one table at a time, with time in between each one, so the quicker they’re ready, the sooner they get to line up. Then call the next table once they’re ready: “Wow, purple table looks perfect! Thanks for being so quiet! You may line up.” If you think the kids at a table would fight for spots, you can pick a certain table then call individual students from that table 1 by 1. I think they can handle all going at once though. Make sure they know they’re not allowed to run or push to the line. If they don’t walk quietly to the line, they sit back down. Doing it by table gives them a sense of pride over the cleanliness of their table and, most importantly, peer pressure to help even if they’re the random 1 in a million kid who doesn’t care about their place in line. Their friends will probably (silently) encourage them to help since they know the more hands that are helping them clean up, the more likely they’ll be done first and get called first. Okay so now you actually have kids in line waiting for other kids to line up. Hopefully you have a designated place in your classroom kids go to line up. It’s best if you have any sort of line they can stand on to stay straight. If your classroom has tile, choose a specific crack in the tile for them to stand on, a carpet edge, up against a wall, etc. If you have nothing like that, put a line of tape on the floor! That’s a super easy way to have them exactly where you want them. You can buy super cute tape with patterns and designs at craft stores. Once they’re chosen to get in line, they can NOT talk. If they talk even once, they’re sent back into the class to help other tables clean up. Zero tolerance. Say, “Wow! Jessie is standing SO nice in line, quietly and with her hands behind her back. Go ahead and clip up!” Jessie going to her clip and moving it up a level will encourage others to do the same. I always say to look for the stars during any activity and give them praise. It helps everyone know exactly what you’re looking for/expect and gives them the motivation to do it. Plus they love getting to go clip up so it’s nice to reward the kids who are on task. Especially try to notice when your students who sometimes struggle with behavior are exceeding expectations to clip them up – it makes such a huge difference! Try to make cleaning up transitions fast (it will be much faster if they’re competing for line space) so the kids who line up early don’t have to stand quietly long. They are still wiggly little littles after all. Clean up for transitions should be quick – they’re simply putting away whatever they were working on, making sure their tables are organized (nothing on top that can be put away, no scraps under the table, etc. ), then sitting down in their seats quietly with their hands clasped in front of them on the table waiting to be called to join the line. The entire table must be sitting and quiet to be called. When standing in line, they should always face forward, mouths closed, staring at the head of the person in front of them, with their hands clasped behind their back. Stress the importance of watching the head of the person in front of them because the line can stop abruptly at any time and you don’t want them to run into the person in front of them. Whenever the line leader’s table gets called, they go to the front spot. Everyone should know that that’s what they do. It’s not cutting. The person at the front of the line accepts the fact that there is a line leader before them. Door holder also goes straight to the door and stands at it quietly until you’re ready to leave. They don’t get to go to those job spots until their table is called though. I definitely recommend having these classroom jobs for about a week at a time so it’s a routine. My favorite job for this time though is THE LINE MONITOR! When you announce that it’s clean up time, say that you’re looking for a line monitor. That’s an easy way to get everyone working hard for that job! After everyone is in line, announce the line monitor. Once a line monitor is selected, they know to go grab the pass from wherever you keep it, put it on, and get back in line. I recommend choosing the best and quietest cleaner to be the first line monitor! Again, so much classroom management power! Simply print the Line Monitor pass (you can get my line monitor passes here if you want the ones I made), laminate it, hole punch a hole in the top, and clip it on a lanyard. You can do it in a fancy lanyard or a simple lanyard like mine. I typically buy lanyards in 12 packs or bigger because I use them for a ton of things! 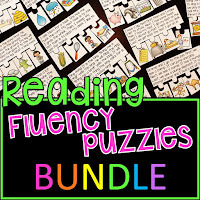 For other passes and math and reading activities too! This class job is also GOLD. It is somewhat similar to the Quiet Monitor job I talk about in my Chatty Class post which is so, so helpful for in-class chattiness. So you know how the line monitor gets to pick where they get into line when their job is done? You can also move the line around as much as you want during your walk for a super easy and effective management trick. Let’s say you’re walking to lunch and a few kids are talking, say, “Thanks so much Ken for not talking in line! You can pick your spot.” Ken can immediately pop out and pick a new spot. Again, never in front of the line leader but any other spot is fine! This does an immediate reset in your line. Everyone wants to pick their spot so they’ll check themselves. This trick honestly works magic every time! & You can use it as much or as little as you want. Of course, whoever he pops in front of cannot say anything about him “cutting” because it’s not cutting – he earned the right to pick his spot. You can do it several times in a trip. I actually think it’s nice to do it a lot in the line to lunch every day because that line order really determines where and who they sit by at lunch and, honestly, they work so hard all day that I want them to get to sit by their friends and chat. It may feel like you’re playing musical lines but who cares? It’s nice for them to get that movement in any way and distracts from the mundane quietness of walking in line and they get to sit by their friends at lunch. 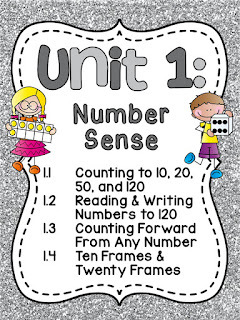 This can be done even as young as PreK in a calm and organized manner. This is up to you if you want to be this “cool” but you could also give out “Pick Your Spot” passes for excellent behavior. It could be something earned by reaching the top of the clip chart (given with the certificate for that chart) or something they earn another way but these are some great incentives! It could also be something they purchase with their tickets, tokens, etc. 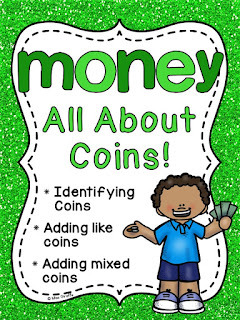 if you have a classroom currency. Laminate these so you can reuse them OR simply print them then tear them up when they use them so they can't be used again. Give them very sparingly! If a kid has a Pick Your Spot pass, they can use it any time you line up and they also get to have the final say in their spot once you reach your destination (in case anyone pops in front of them during the journey). You can have it be a one time use for one line only or it can be something they get to wear all day on a lanyard (I made the cards to fit inside a lanyard just like the Line Monitor pass) and use it in all the lines they stand in that day. If it’s an all day thing, I recommend they only get something like that for doing something amazing like reaching the top of the clip chart. This is an awesome reward for getting to sit by your friends at an assembly or even just for lunch or being first out the door to recess. At first, you’re going to want to walk backwards to watch the line. As they learn the rules more and see how consistent you are with your expectations, you can trust them more… but for now, walk backwards! It’s surprisingly easy but make sure you look back constantly – students can be surprisingly slow to warn you that you’re about to walk into a wall haha. Your kids should eventually learn how to walk without you even needing to be there. This is why the line leader is actually a super important job. It depends on the set up of your school but basically, teach your line leader to keep walking until they reach a building corner (if you’re inside, the corner edge of the hallway wall at the end of the hallway; if you’re walking outside, the end of the wall before reaching a corner of a building) and then stop. This really keeps your line looking so nice because no one can really trail behind and leave those big gaps since you stop every so often and it gives everyone a moment to catch up. The line leader stops for a moment until you say “Go ahead” or “Next corner” or whatever your signal is and does this at EVERY corner, always. It actually isn’t that many stops and it really keeps your line looking nice. Plus it teaches your students that they have to always pay attention and look at the person in front of them in case they stop. This also allows you to walk up and down the line if you want to while the line is walking. You don’t ever have to stop the line to go talk to someone who isn’t behaving properly. The line is a machine that runs without you. I highly, highly recommend this approach of walking in line. It is super efficient. It’s also a quick and easy way for you to connect with your kids. Walk down the line and smile at someone and whisper, “Nice job” – trust me, the other kids will hear and notice and strive for the same positive attention. So much less stressful than walking backwards trying to watch 2 dozen kids standing in front of each other at the same time. The other class in your grade level may walk by with a bunch of their friends in it or their previous teacher they want to wave to. Teach them that the nicest way to say hi to their previous teacher is to show them how nice they walk. Tell them they can smile and nod at their friends in another class, of course, but no waving or talking. Show them how they can smile and nod to say hi then immediately go back to looking at the person in front of them so they don’t run into them. Do role playing of the smile and nod in little mock scenarios in the classroom. They’ll think it’s funny to act out (act out both what to do and silly examples of what NOT to do) and it’ll help them learn the concept of Smile and Nod. Also, if your class passes by another class that is walking in a nice line, make it a point to compliment the other class about how nicely they are walking. If there are classes you constantly walk by, ask the teacher the next time you see them without kids if they’ll also do that if they see your class walking nicely. Students loooove to be complimented by other adults that aren’t their teacher. If they do get a compliment from another adult, teach them to smile and nod as they continue walking then make a huge deal about how proud you are of them for getting a compliment on their walk whenever you get to where you’re walking to. Like I said before, all of these tricks are to be used interchangeably. Some days you might take the quiet turtle, some days you might have a line monitor, other days you might just switch people in line. All classroom management tricks, no matter how awesome they are, can lose their shine if you use them all the time so use different ones on different days. Don’t do the quiet turtle EVERY day or they’ll get over it.. maybe a few times a week at the most to keep it special. The quiet turtle also allows you to tie it all in to your voice level chart if you use the one from my Chatty Class pack where the quietest level is the Quiet Turtle, which helps them manage their voice levels when you’re in the classroom too. Never??! Please tell me you have. Anyway! If that ever does happen to you and you’re stuck outside the music room door while another class finishes up for 5 or 10 more minutes with 24 six and seven year olds to entertain, that’s okay! Do some fun Silent Activities! Try to get them up against a wall if you have one available so you’re out of the way of anyone else who wants to walk by. It also helps keep them in line and not spread all over. Then stand in front of them, in front of the middle of the line. * The obvious “Miss Giraffe Says” game but with your name. Miss Giraffe says, “Touch your nose.” Miss Giraffe says, “Hop on one foot.” Miss Giraffe says, “Stop.” etc. If they do a command you say without you saying “Miss Giraffe says” first, they have to sit down in their place in line. Have them sit out for 2-4 more commands only or they’ll get restless. 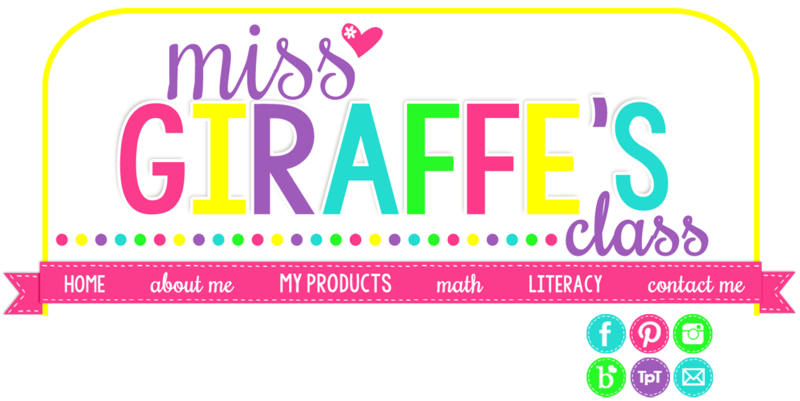 Just say, “Miss Giraffe Says Everybody Up” to invite anyone sitting down back in the game. If you have a super well-behaved class, you could play until there’s a winner (once they sit down, they’re out until 1 person is left standing) but most classes will get restless… and it’s more fun for everyone to keep playing anyway. * My favorite thing to do is SIGN LANGUAGE Sight Words! Or spelling words. 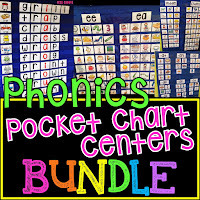 If you use my Sign Language Secret Sight Words or Sign Language Secret Words for the various phonics sounds then your kids already know the sign language alphabet letters from all the fun game cards they practice during centers. All of my sign language secret words packs come with my Sign Language Alphabet Chart plus I also have my Sign Language Alphabet Posters hanging right above my regular Alphabet Posters so it’s everywhere and it’s a super fun thing to learn in the classroom! My sign language A poster is right above the A alphabet poster, the sign language B poster is right above the B alphabet poster, etc. so it’s an easy quick reference. I also talked about it a little bit in my How to Help Gifted Kids Engaged and Learning post but it’s really fun for everyone! So anyway, stand in front of the line in the middle while they stand against a wall. Use your fingers to finger spell a word. Have them copy each letter with their hand and try to remember what letter that is. Make sure to tell them to not say anything out loud because it's a secret word they're trying to figure out :) Spell a simple word (3 or 4 letters max) letter by letter than have them hold it in their heads. Spell it quicker 1 more time. Give them a tiny bit to think then tell them to whisper it to each person next to them if they think they know what it is. Then say, “Whisper share!” and they will chorally whisper the secret word. It’s super fun! You can do it with the sight words you’re learning that week or your spelling words. If you think that is too hard for them (they can do it in first grade and up if they normally do my Secret Sign Language word centers) or you don’t use my sign language centers, you can simply tell them you’re going to teach them a secret language and teach them how to sign the letters of the alphabet. Whisper A and make A on your hands and let them all copy you. Then do B. Then C. Then have them do A, B, C together. Do this in groups of 3 letters at a time (DEF then GHI then JKL, etc.) to learn the alphabet. This will keep them super interested and occupied. If you don’t know the alphabet, bring a Sign Language Alphabet Chart with you to reference. It’s an awesome way to keep them quiet! Once they know the alphabet well because you’ve done this a few times, you can then finger spell their spelling words or sight words like I said above later on in the year. Make sure you go over the word after they’ve told you what it is for the kids who might not have gotten it. Finger spell it together, whispering the letter this time as you make it, and then say what the word is. Finger spell as you say “T” “H” “I” “S” we spelled THIS! Go slow enough so they can finger spell it with you as you make and say the letters. * Math problems. Ask them a math problem (Ex: 3+5) and have them make it on their hands and put them behind their back. When everyone’s hands are behind their back, tell them to either show you all at once or share with the person next to them then all share at the same time. Go over each problem in a whisper to explain the answer so it’s great learning too. “Awesome! We had 3 (hold up 3 fingers) and we added 5 (count up 5 more on your fingers) to get 8 so our sum is 8! Okay next one…” Easy and quick way to get a little math practice in! Phew okay, that is a lot! Did you know someone could talk this much just about lining up?? I am notorious for super long blog posts so you probably expected it from me. :) I really hope this could help give you some great tips on how to have a quiet, well behaved line! I have A LOT more helpful blog posts if you need help with classroom management! 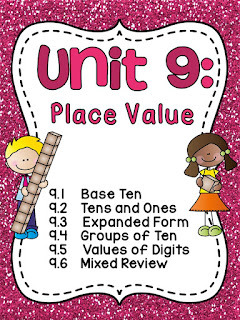 I also have a ton of posts about how to teach various math concepts, reading skills, classroom decorating tips, and so much more. This one had a lot of words but I usually show a ton of picture examples too so definitely check out my other posts if you want some inspiration and ideas! If you want to see when I post new teaching resources, you can follow me on TpT or follow me on Facebook if you want to know when I post new blog posts and for other fun ideas. Feel free to pin any of the images from this blog post on Pinterest or this one to save this post to read later!